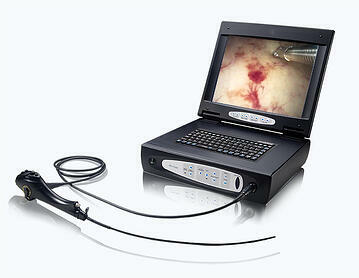 Endoscope - A thin, tube-like device that is inserted into the body. At the end of the tube, there is a camera or imaging device, allowing the physician to view the body and organs without the need for surgical access. Digital monitor – The use of a digital monitor depends on the type of endoscope your physician is using. If they are using a video scope along with the monitor, they can view images of your internal anatomy right on the screen. Sheath – The PrimeSight endoscopy system is unique because the endoscopes are used with the EndoSheath® protective barrier that completely covers the endoscope and ensures that the endoscope does not come in direct contact with the patient during the procedure. When the endoscopy is finished, the single-use barrier is removed and discarded. The endoscope is then prepped for use on another patient with a brand new, sterile barrier. How does PrimeSight Endoscopy work? Prior to the patient’s procedure, the endoscope is placed inside a sterile, single-use EndoSheath cover. Following the completion of the procedure, the endoscope is then removed from the sheath, which is discarded. The endoscope is wiped down then prepared with a new, sterile sheath for the next patient. PrimeSight Endoscopy systems feature unique technology that is FDA Cleared, CE Marked, and recognized by the Center for Disease Control. Over five million EndoSheath products have been sold without a single reported complaint of patient-to-patient cross-contamination. In addition, there are more than 30 research studies on EndoSheath technology evaluating various aspects such as safety, efficacy, clinical performance, cost-effective implementation, and comparative diagnostic quality. Learn more about endoscopy safety.